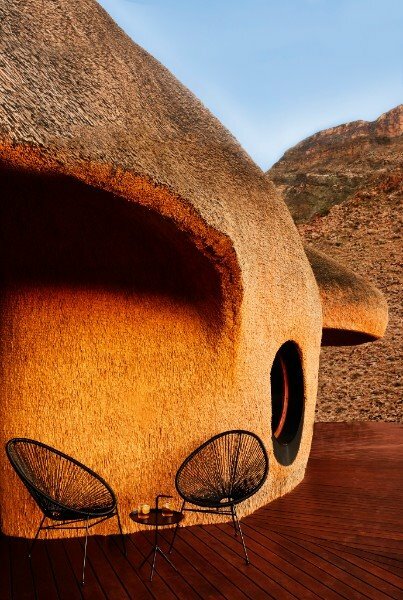 The Nest at Sossus, which will be opening soon in the Namib Tsaris Conservancy, is a new exclusive-use private villa whose unique thatch design was inspired by communal nests constructed by local social weaver birds. The property, which has been eight years in the making, sports four en-suite bedrooms, including a specially designed children's room, and can accommodate up to seven guests at a time. It also has a swimming pool and kiddies playground, as well a library. Located near Sossusvlei and the Namib-Naukluft National Park, the landscape surrounding the villa is dotted with camelthorn trees and wildlife such as giraffe, cheetah, leopard, spotted hyena and antelope can be viewed as they visit the waterhole located nearby. A guide is provided to help you enjoy a game drive around the scenic countryside and onwards to tourist attractions such as Namib-Naukluft National Park and Sossusvlei, 45 minutes away. On your return, enjoy drinks on the terrace overlooking the ravine below while your personal chef prepares a gourmet meal. All bookings at the villa are subject to a minimum three-night stay, but with a setting as awesome as this, you may want to linger a little longer. Located within the 24,000-hectare Neuhof Nature Reserve in the Greater Sossusvlei-Namib area, Sossus Under Canvas is another exclusive option that guarantees residents complete privacy while enjoying some of the best scenery that Namibia has to offer. The seasonal lodge, which is open for bookings between April and November, consists of eight semi-permanent canvas tents that offer guests an authentic desert camping experience, with a touch of class. The tents are clustered in a natural amphitheatre formed in a rocky outcrop of granite that provides a secluded refuge from the prevailing desert winds. While the accommodation and facilities at the camp are pared down to basics, comfort has not been compromised. 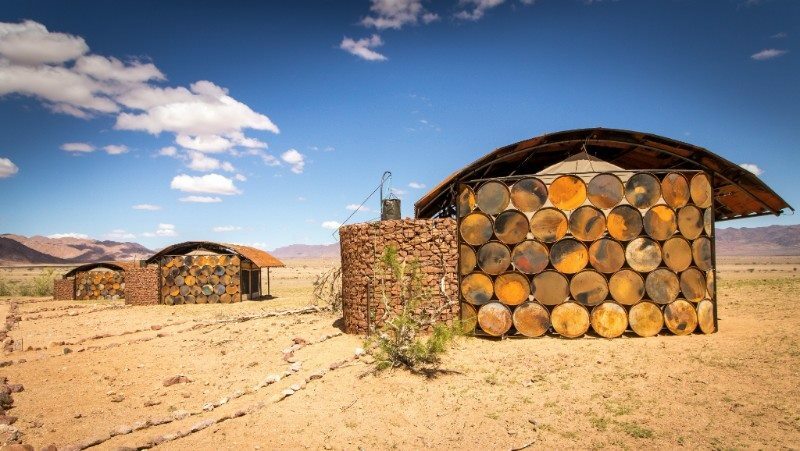 Instead, the camp's structures have been constructed from natural or recycled materials, such as rock, wood/recycled lumber and oil barrels, which give it an authentic rustic air. Lighting is powered by solar — there is no shortage of sun in Namibia after all. The main camp features a central lounge and dining area where guests can get together and socialize while enjoying one of the three main meals served each day (rates include breakfast, lunch and a 3-course dinner as well as local drinks and activities). Each of the eight tented suites, consisting of 4m x 4m Meru tents, leads out to an open-air outdoor ensuite bathroom equipped with a flush toilet and bucket shower. There are two family units, with the remaining six either set up as double units or twins depending on guest preference. Activities include scenic flights in a hot air balloon, helicopter, or fixed wing aircraft; overnight hikes, sleeping under the stars; guided tours and general exploration of the private Neuhof Nature Reserve. 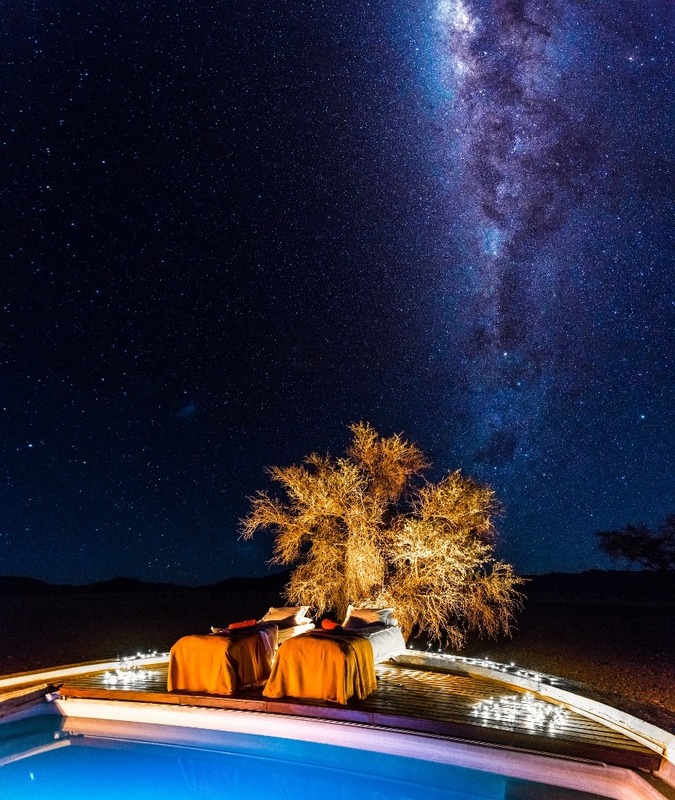 If you're looking to get far away from the maddening crowds, these two options will let you enjoy the peace, tranquility and wide open spaces the Namibian desert landscape is renowned for, in a truly private setting that you can enjoy with family or close friends.